I recently had a conversation with a technical diver who explained that his “backup” depth gauge and timing device was his older sport diving computer in gauge mode, but that the screen would occasionally “go dark” during a dive. A little bit stunned and bewildered, I asked if that didn’t make him at least a little bit nervous? His reply was that he didn’t worry about it too much because it was just his backup. In technical diving, one thing we emphasize is redundancy. We carry two or more of everything, regulators, lift bags, reels, redundant bladders (yes, I know there are many who argue over this one), you name it. Backup timing devices are among the more critical components we carry at least two of because in the event of a failure, we’re basically left to memory and wild guess what our decompression schedule must be. To me, the idea of trusting my life to a faulty backup is just stupid. That’s especially true with the availability of the Scubabpro 330M Digital Gauge. The 330M is simple. It tracks your depth and bottom time to 1082 feet, along with surface interval, temperature and ascent rate. It is easy to read, and near bullet proof. The price is around $250. So, to save a couple hundred bucks, this guy is essentially diving without a backup timer and depth gauge. Hopefully, my gentle coaxing convinced him this might not be such a good idea. 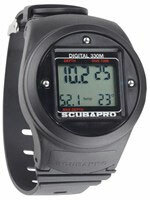 Obviously, there are lots of options for dive computers, but the Scubapro 330M Digital Gauge provides simple, affordable, easy-to-read backup (or primary) depth and time for every dive condition. This entry was posted in New Dive Gear, SCUBA Gear Reviews, Technical Diving and tagged dive computer, tec gear, tech gear, technical diving. Hey Martin, Thanks! Let’s get in the water when I get back from Kona! Any chance I’ll see you there?